I’ll have a Thanksgiving myth with my pumpkin pie | Melissa Tabeek. Yeaaah…that’s not actually Thanksgiving. Thank you, primary education. Thanksgiving is a complicated holiday in the states, mainly because it celebrates a myth that never happened. 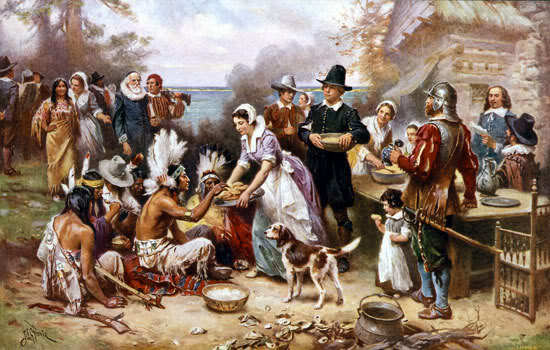 Pilgrims and Indians didn’t sit down together to break bread on this proclaimed Thanksgiving Day in 1621. They did have a big feast after their first winter, in 1621, where the American Indians helped them learn how to survive – but this wasn’t Thanksgiving. The holiday was created by governor John Winthrop in 1637 to celebrate the return of men from fighting Peqot Indians in Mystic, Connecticut. This fighting not only led to hundreds massacred (about 700), but also kicked off the ensuing century after century of continued conflict between those fighting for their land and those who were taking it. It’s a struggle that has changed, but not ended for Native Americans. There are some statistics I read this morning in this article that are important to note as well. The Substance Abuse and Mental Health Services Administration reports that the suicide rate among native youth ages 15 to 24 is 2.5 times higher than the overall national rate. There is an event that I never attended when I was going to graduate school in Massachusetts that I wish I had had the chance to called the National Day of Mourning, which has been held in Plymouth for 45 years on Thanksgiving Day. Moonanum James, the son of Wampanoag leader Wamsutta Frank James who started this day in Plymouth, call it this because it was the end of American Indians’ way of living as they had known it for so long. Thanksgiving would mean so much more if meant that as a nation, we would also be paying respect to history (not the lies our teachers told us) and attention to the issues that still plague American Indians. It is a nice sentiment to have to a day to remind us all to be grateful, but it’s an empty one unless the truth is paid mind as well.